With the changing season we felt it was time for another boy/unisex pattern and it is a fun one! 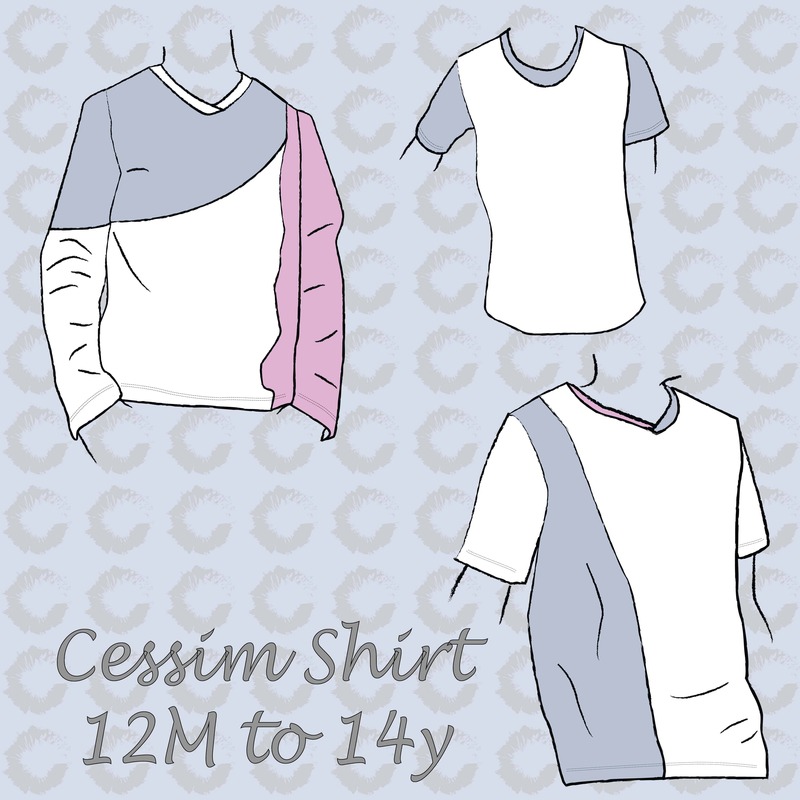 The Cessim Shirt is appropriate if you are moving into or out of winter. The Cessim is a relaxed fit shirt which is comfortable during warm weather and suitable for thicker fabrics in winter. With so many options you can almost never make the same shirt twice! There are four basic body colorblocks, three sleeve lengths and three neckline options. This pattern could easily become a staple in your kids wardrobe because it is both perfect for using scraps and/or panel fabrics. But, let’s take it a bit slower and take a detailed at all the options one by one. Let’s start with the color block options for the bodice. The first option is perfect for beginners. The body is one piece which also makes it a lovely option for panel fabrics. The seam is at the back of the shirt. The second body option has two pieces, but instead of a front and a back, the seams are moved which creates a fun option to play with contrasts. The smaller side pannel is perfect for scrap fabrics that were left after cutting circle skirts. This option is also a beginner friendly one. The third option lets you play with two fabrics, but now with a curved upper color block. This upper color block is especially perfect for scrap fabrics. This option, due to the curve is advised for intermediate sewists. We added many marks to line up your pieces, so if you are an adventurous beginner you do not have to fear this one, but it is a bit harder to get it right. The last and final body option consists of three different pieces to color block with. Both the side panel and the upper curved color block are combined in this option. This option was loved by the testers, and many used this option for a second and third shirt to show off their color blocking skills. Now that you have seen the body options, let’s move on to the neckline options. There are three. There is a more standard V neck, a color blocked V neck and a rounded neckline. The rounded is not a typical round neckline, because it is fitted in a V neck hole and therefore creates a fun extra design element in the front where the ribbing is extra visible. For the sleeves there is a standard short sleeve, a half sleeve (at around the elbow) and a long sleeve. For both the long and half sleeve there is an option to colorblock the sleeve, so that the curve of the body is continued onto the sleeve. Our testers were inspired by the seams and ease of sewing this pattern and they added some extra seam decoration in the form of frills and extra fabric strip. Others sewed shirts for the entire family! Like with every release we have a very attractive sale price for you. The Cessim shirt is on SALE from Thursday 23.55 CET to Sunday 23.55 CET. The price is €5 excl VAT.